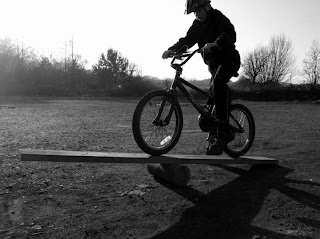 Above : Activ8 scouts were the first group to try out the new BMX skills equipment. Activ8 was the first big event at Fordell this year, and had been organised as a camp to promote the Explorer Scout (14-18 year) section to younger scouts who may be moving up soon. 2 other similar events had also been arranged for different weekends at the Auchengillan and Templars Park centres to cater for other areas of Scotland. Over 60 scouts attended the camp, with a huge turnout of Fordell staff(19) and other staff who had come in to help with catering and administration. Scouts arrived throughout the friday evening and were welcomed by a most unusual reception facility - the much-loved bongo/space bus which had been moved to the car-park and converted to a roll-on, roll-off scout registration facility. After pitching their tents next the the Henderson building, the staff laid on some activities (inflatable gladiators and sumo wrestling) in the wet weather hall for a few hours. Warden Bob then took over with the World's Longest Widegame, cunningly designed to remove all energy from the scouts and ensure a good night's sleep (in theory, not practice). Above : Scout showing his friend how big the fish was he caught in the Fordell pond. After supper, the scouts headed back to their tents looking forward to a fun night without any leaders. Unfortunately no-one had told them that Bob would be keeping a (very) close eye on them,and had comandeered the bothy situated just yards from their campsite. Even so, many of the scouts didn't appear to get much sleep but made up for it at various stages of the next day. Saturday was spent taking part in 5 separate activity sessions around the site, with everyone seeming to have a great time. The new BMX track had been set up in the carpark and proved a hit with everyone, and survived intact which proved that the design was durable. Amongst the other activities ongoing were archery, caving, challenge course and teambuilding - as well as time to mingle with the odd celebrity (the site's own reality TV star, Rory). Above : Callum combines ballroom dancing with unihoc. Saturday night and after a quick break and hot meal it was back to more activities with 4 different bases. District Explorer commissioner Barry gave a great presentation about the Explorer section in the form of a 'Who Wants to Be a Millionaire' quiz, while other staff looked after a beetle drive, some indoor games and a game of unihoc. The unihoc proved very popular despite Ginga's attempts to spoil it by playing his Boney M album on the stereo. A few of the local Explorer scouts ran a campfire later on which was well -attended and featured the dazzling juggling skills of Fordell's own Ali with his fire-poi (see slideshow below). Despite nearly setting his trousers on fire during rehearsals, Ali persevered and treated the scouts to a spectactular show. 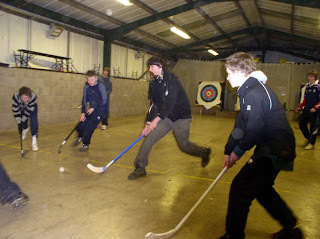 Saturday night was slightly quieter for Bob in his bothy as tiredness finally started to affect the scouts. There was a noticeable delay in many of them appearing for breakfast, which the staff took advantage of by eating their bacon rolls. 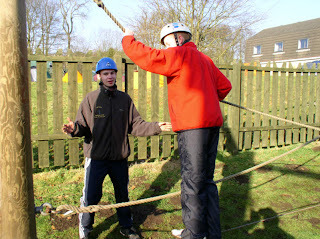 The scouts took part in more site activities on sunday morning before a quick lunch, closing ceremony and journey home. Due to the big staff turnout there wasn't a huge amount of clearing up to be done in the afternoon and pretty soon the site was all ready for the next visitors. Back to normality next weekend, but the busy weekends are not too far away again.